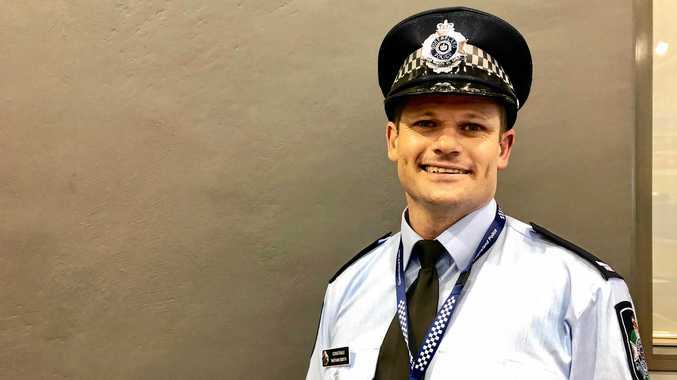 GLADSTONE man Nathan Smith decided to pack up his family and close his business to head to the Queensland Police Academy - then missed his first day of cop school. "We moved up (to Townsville) a little bit early in the hopes of (my son) being born after I had settled in but he came on the first day of academy,” he said. The father of four was one of 46 new constables inducted into the Queensland Police Service in Townsville on Thursday. Constable Smith, 37, said it was an indescribable urge to give back to the community that made him sign up. "There was an innate feeling, just something inside that you just feel you need to become a police officer and help people and protect and serve,” he said. A former physiotherapist and businessman, he will move back home to Gladstone as a fully fledged police officer. Constable Smith's sons, aged seven, five, three and five months, are also excited about his new role. "I get asked a lot every day, when are they going to be put in jail and what they have to do to stay out of jail,” he said. "My eldest son, I did a random breath test on him and he 'failed' it and he started crying. Constable Smith has aspirations of one day become a detective but for now he is looking forward to the unpredictable challenge of the job. "Throughout academy no one day has been the same,” he said.